You will know Degas, of course, and probably Toulouse-Lautrec. But in the rewriting of the history of Impressionism, you almost certainly didn’t hear about Jean-Louis Forain (1852–1931), or see those works of his which are owned by a large number of major galleries and museums around the world, but not on display in most. For the period up to about 1900, Forain was a follower of Degas (1834-1917), and painted fairly similar motifs: dancers, horse racing, women washing themselves. But his style was quite different, and he produced some radical and controversial paintings too. After 1900, he concentrated on social realism in law courts and everyday life, in a similar vein to his other muse, Honoré Daumier (1808-79). But throughout, Forain’s paintings were distinctive, incisive, and often savagely satirical. This, the first of two articles, will look at Forain’s life and works up to 1900; the second will complete the account from 1900 on. Forain was born in Reims, but when still a child moved to Paris. He first worked as a caricaturist for the thriving Parisian press, but wanted to develop more artistic skills. He enrolled at the École des Beaux-Arts in Paris, where he studied under Gérôme and Carpeaux. He became a close friend of Rimbaud, as well as Paul Verlaine and Joris-Karl Huysmans. 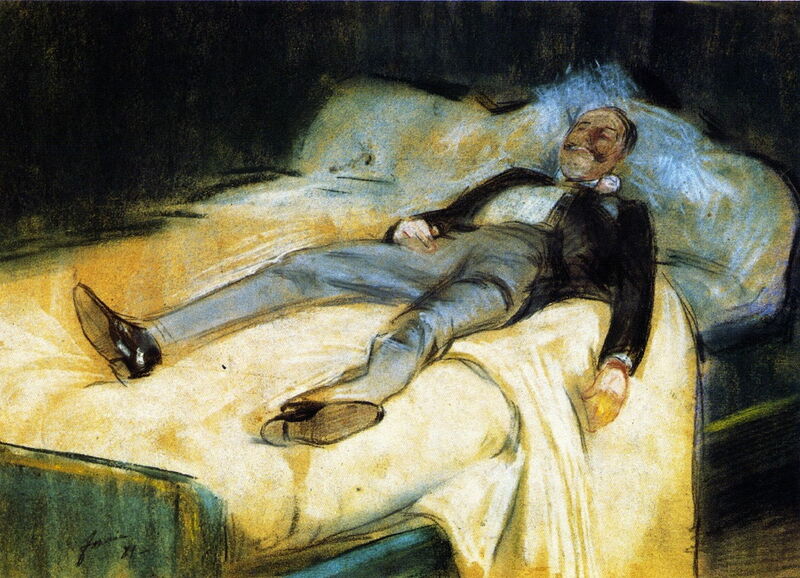 He soon became a member of the group centred on Manet and Degas, which met and debated in the Café de la Nouvelle-Athènes in Montmartre, and adopted Degas as his artistic mentor. Jean-Louis Forain (1852–1931), The Admirer (1872/1886), oil on canvas mounted on wood, 15.2 x 20.3 cm, Museum of Fine Arts, Houston, TX. Wikimedia Commons. 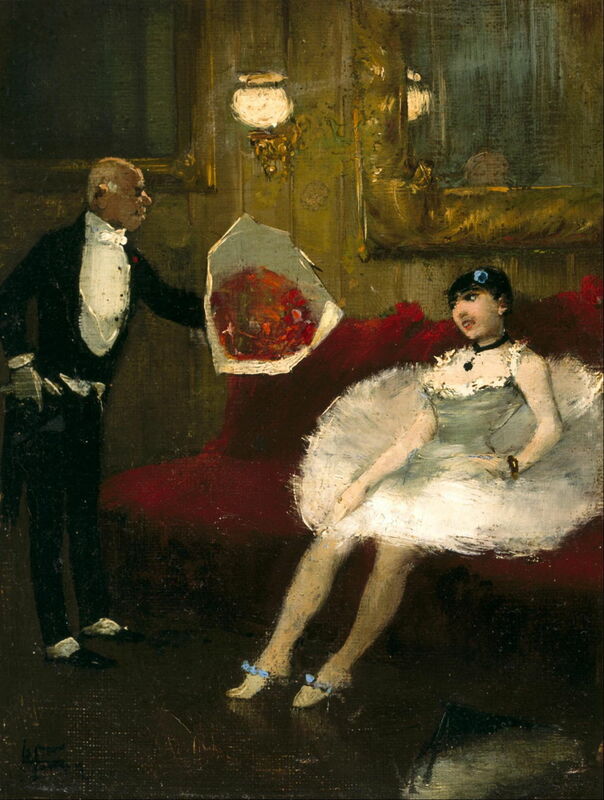 Impressed with Degas’ many paintings of dancers and ballet, Forain started to produce his own interpretation of the sordid relationships between rich, much older men and the young girls, in paintings such as his The Admirer (1872/1886). 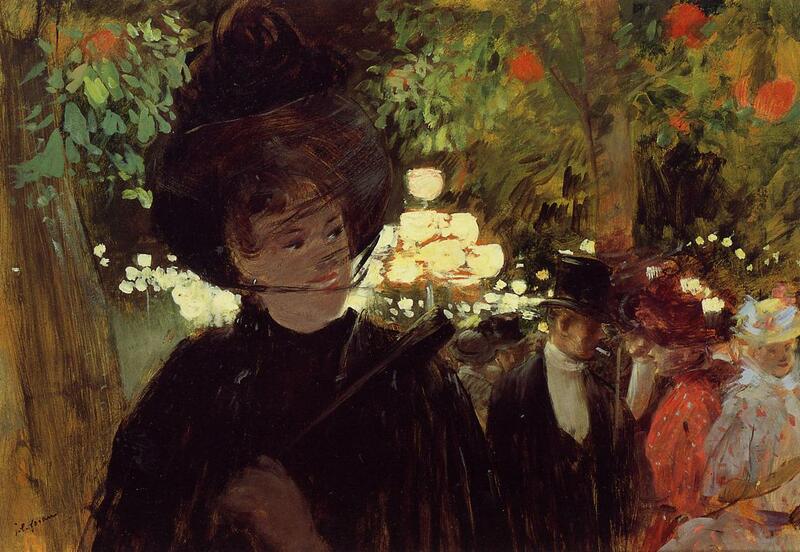 It was not long before Forain’s depictions of night life in Paris became controversial. 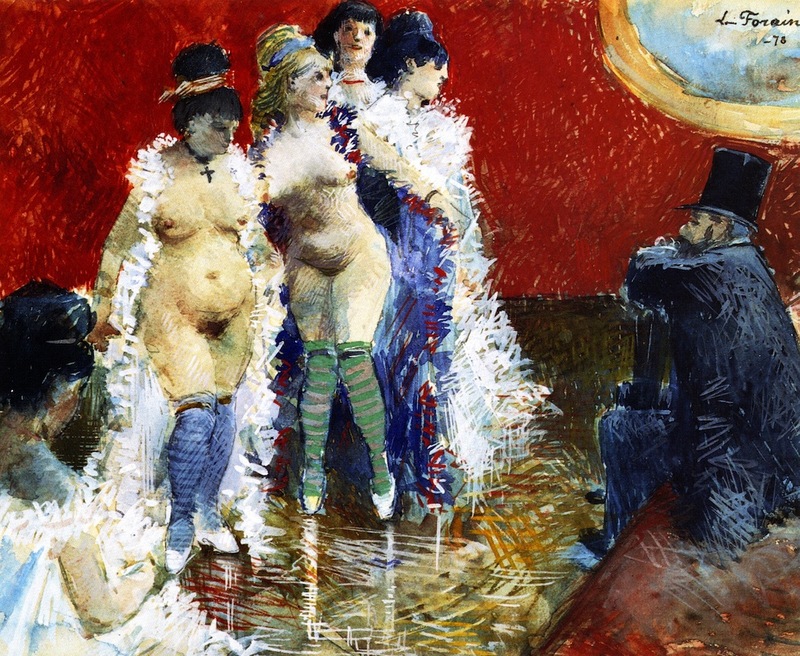 His candid view of endemic prostitution shown in his watercolour The Client (1878) surpassed those of Degas, and perhaps even Forain’s more conventional political satires. These paintings were later to inspire Henri de Toulouse-Lautrec (1864-1901). 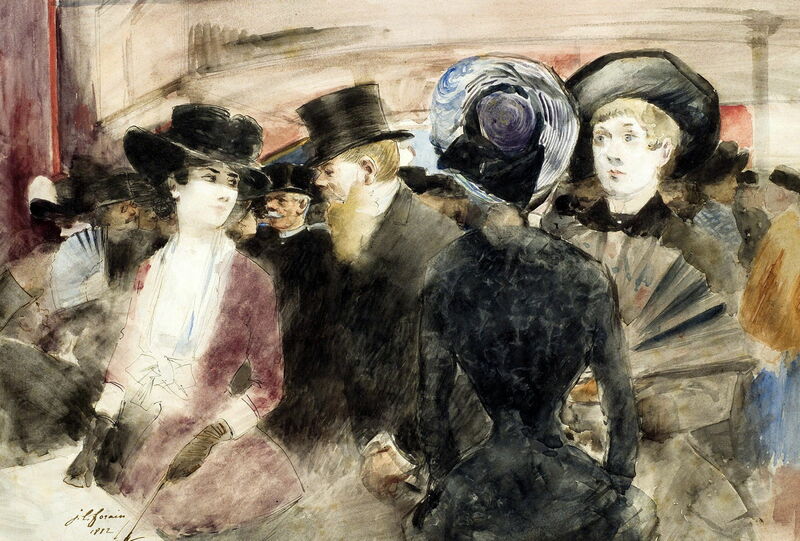 Jean-Louis Forain (1852–1931), The Bar at the Folies-Bergère (c 1878), opaque watercolor with graphite underdrawing on paper, 31.8 × 19.7 cm, Brooklyn Museum, New York, NY. Wikimedia Commons. Forain’s gouache view of The Bar at the Folies-Bergère (c 1878) was painted several years before Manet’s much more famous painting (1882). I do not know whether Manet saw Forain’s, and if he did, whether it was of any influence. Forain shows the reflection of the barmaid, but much of the reflection is taken over by his characteristic brushmarks. As one of the youngest of the Impressionists – he was twelve years younger than Monet, and eighteen younger than Degas – he did not take part in an Impressionist Exhibition until the fourth, in 1879, but took part in most of the remainder. He was not only successful in exhibiting in the Salon of 1884, but attracted favourable comment from the critics. Forain was also very skilled working in pastels, capturing the ‘morning after’ so well in his After the Ball, or The Reveller (1881). Jean-Louis Forain (1852–1931), At The Theatre (1882), watercolour, pen, black and brown ink, and traces of graphite on paper, 33 x 49 cm, Private collection. Wikimedia Commons. 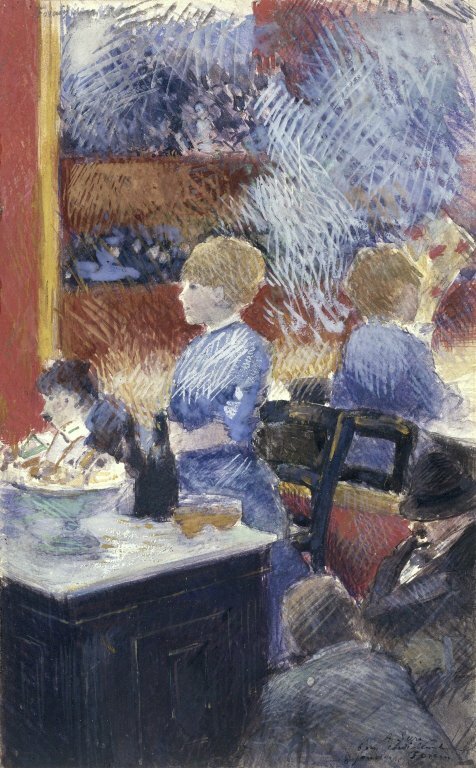 At The Theatre (1882) is another watercolour which shows influence from Manet and Degas. Jean-Louis Forain (1852–1931), Le Jardin de Paris (The Garden of Paris) (c 1882), oil on panel, dimensions not known, Private collection. The Athenaeum. Le Jardin de Paris (The Garden of Paris) (c 1882) is an outdoor nocturne, this time painted in oils. Jean-Louis Forain (1852–1931), The Public Garden (c 1884), oil on canvas, 54.9 x 45.7 cm, Private collection. The Athenaeum. The Public Garden (c 1884) shows the impossible demands being made by the women’s fashion of the day. 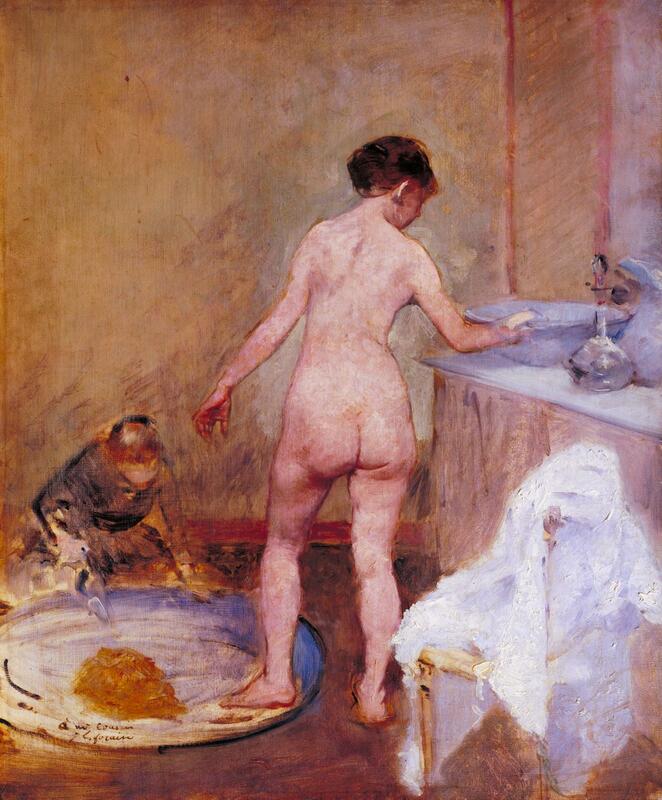 Forain followed Degas in his fascination for scenes of women bathing, for example in his The Tub (c 1886-7). He continued to produce popular satirical artwork too, and in 1892 published the first volume of an anthology of his drawings to accompany (and often help disrupt) recent political problems, such as the Dreyfus Affair. Jean-Louis Forain (1852–1931), The Artist’s Wife Fishing (1896), oil on canvas, 95.5 x 101 cm, The National Gallery of Art, Washington, DC. The Athenaeum. In 1891, Forain married the painter and sculptor Jeanne Bosc (whose work seems to have vanished completely). 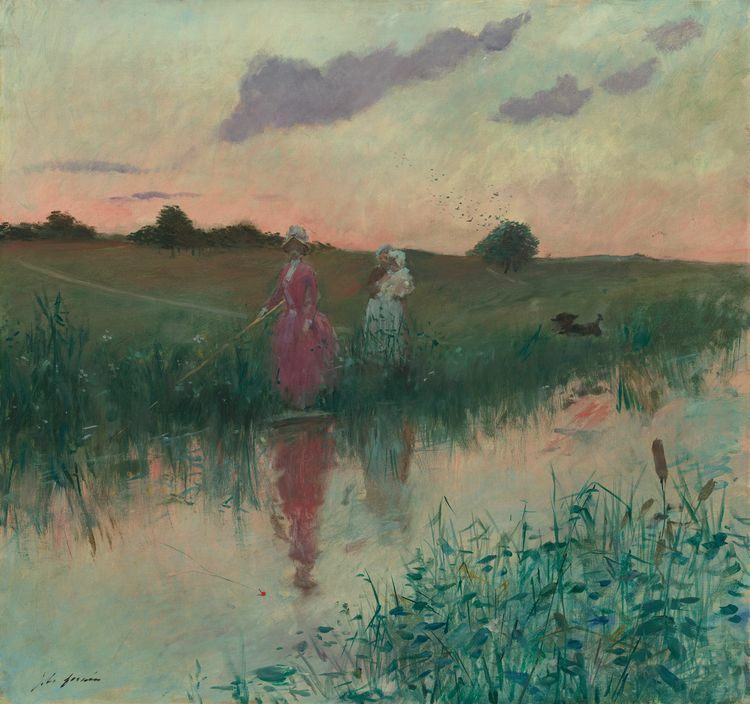 Judging by his exquisite twilight landscape The Artist’s Wife Fishing (1896), she also enjoyed fishing. 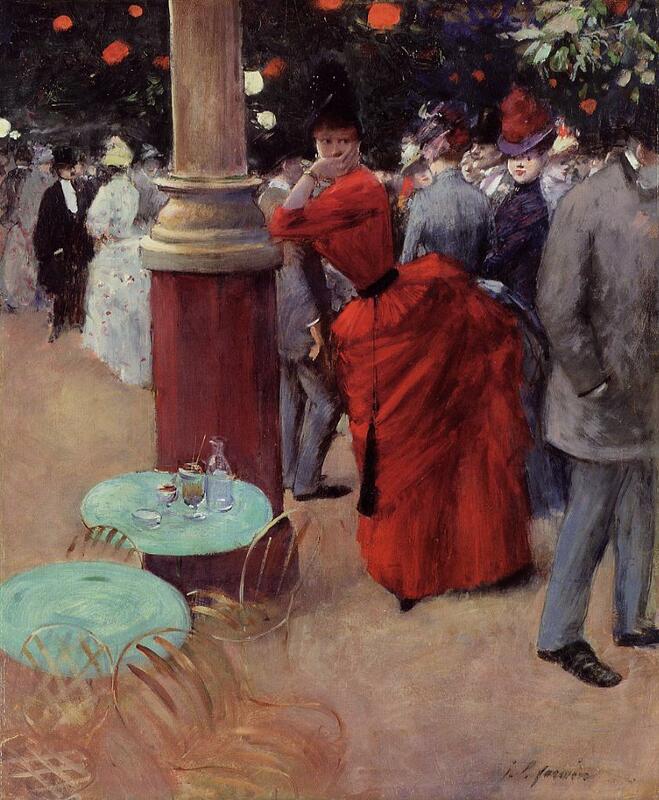 Posted in General, Painting and tagged Daumier, Degas, Forain, Impressionism, painting, Toulouse-Lautrec. Bookmark the permalink. How long will the SSD (in my Fusion Drive) last?